ate market conditions continue to be strong, and favor Sellers. The average median condo sold sales price for 2018 in Tahoe Donner was $362,450. Inventory levels of available condos/townhouses for sale in Tahoe Donner remain critically low and limited with Buyers having very few buying options most price points. On January 13, 2019 there were only 36 home for sale. Tahoe Donner condo/townhouse prices were up +5.1% for 2018, with a median average sales price of $362,450 (TSMLS Areas 9TD), which continues the upward price trend. 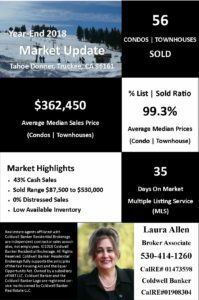 In 2018, Sellers realized 99.3% of the their listed condo price to the sold average median sales price in the greater Tahoe Donner area (MLS Areas 9TD). This is close to the over-all region, which was slightly higher at 99.5%. In every day terms, this means Sellers are very close to their full asking price, if they have priced their property correctly. It also means Tahoe Buyers that want to low-ball, or be really aggressive on their offered price are going to have a hard time in this market. Days on Market (DOM) dropped significantly in 2018. For 2018 the number of days on the market for condo/townhouses is now at 35 days, which is down seventeen (17) days from 2017, which is a 33% decrease in marketing time. 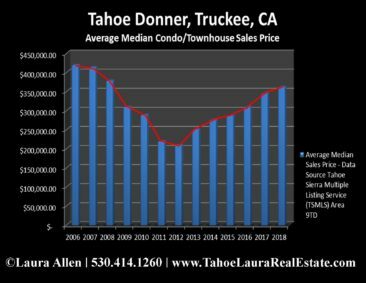 Tahoe Donner is following the North Lake Tahoe – Truckee Regional Pricing Trends – The Tahoe Donner condo market is following the entire North Lake Tahoe – Truckee region and increased +5%, which is below the North Lake Tahoe – Truckee regional condo/townhouse price increase of +7% for 2018. If you already own a condo/townhouse in the Tahoe area and want to know what is your property is now worth? Call me call Laura Allen, 530.414.1260, for a confidential consultation. See new listings as soon as possible. 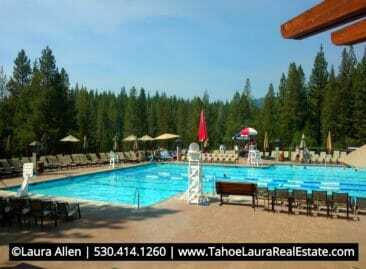 Tahoe second home Buyers should try to driving up the next day to see the property and not wait until the weekend. Ready, set, go! Be prepared to make a buying decision immediately. Work with an experienced local Tahoe Real Estate Agent. They understand the market conditions, and many Buyer Agents know how the other side negotiation tactics. If you will need a loan, make sure your lender has approved you. You will need to move quickly and not having your loan lined up will put you at a disadvantage. If you are buying a condo or townhome in the area, make sure you are using a local lender. Using a local lender that has recently processed a loan in the complex you want to buy in will do two things for you. One, you will have the confidence that the lender has already reviewed their HOA docs and previously approved the development, increasing your odds of the same outcome. Second, Sellers that know you have selected a lender with this experience will give you extra credit for knowing your lender is ready to go on their property. If you want more long-term North Lake Tahoe – Truckee real estate data, check out the following table that has a lot of data going back over ten years. I’ve included both the average median sales price and average sales price (in some cases there is a significant difference between the two, but the trends are the same direction for both) are included for each year in the following table. *YTD period is 01/01/2018 – 12-31-2018. Data Source: Tahoe Sierra Multiple Listing Service (TSMLS). Want to learn more about Tahoe Donner? What is the Tahoe Donner Property Inspection Program? Can I fence in my Tahoe Donner Home? 9 Tahoe Donner Second Home Buyer Tips! Why Buy a Home in Tahoe Donner? Want to see other Tahoe Donner Market Reports?